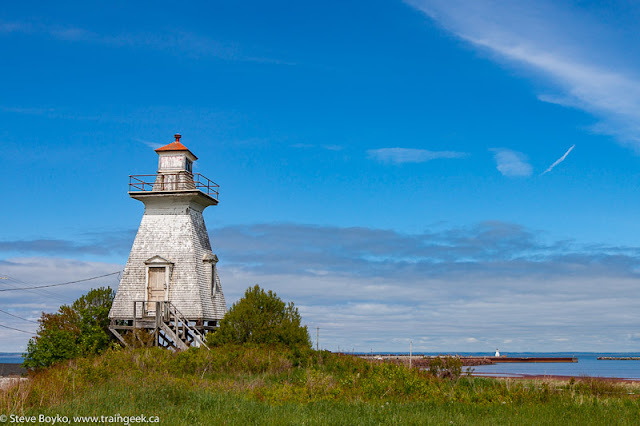 The village of Cape Tormentine was once a very important location, being one terminus of the ferry between New Brunswick and Prince Edward Island. The Cape hosted the ferries that carried people, vehicles and rail cars between the mainland and Borden, PEI. The opening of the nearby Confederation Bridge on May 31, 1997 rendered the ferry service obsolete. Cape Tormentine was the end of the CN Tormentine subdivision that ran to Sackville, NB to connect with the rest of the CN railway network. This track diagram, from the August 1988 CN Car Control manual, shows the layout of the track in Cape Tormentine at the time. R059 - turntable and roundhouse. Reacher cars (usually flatcars) were used to "extend the reach" of the diesel locomotive to allow it to move cars on and off the ferry without the diesel locomotive putting its weight on the ramp or the ferry. The nearby Hill Yard, less than a mile away from Cape Tormentine, had two storage tracks of 2515 feet each. The last train left the Island on December 28, 1989 aboard the M.V. John Hamilton Gray, with CN 1786 and 1750, six flatcars, two tank cars, two gondolas, two snow plows and two cabooses. There's a lovely A.W. Mooney photo on Railpictures.ca showing CN 3632 in front of the station. An RS-18 was stationed in Cape Tormentine to switch the ferry. On a recent trip to PEI, I decided to stop to visit Cape Tormentine. I had never been there before, and a recent series of photos posted by Taylor Main inspired me to visit while the railway infrastructure was still present. 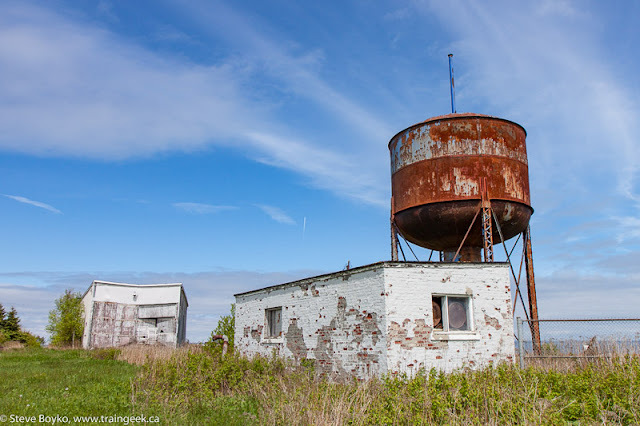 Cape Tormentine features several railway buildings - the train station, roundhouse, turntable and water tower. 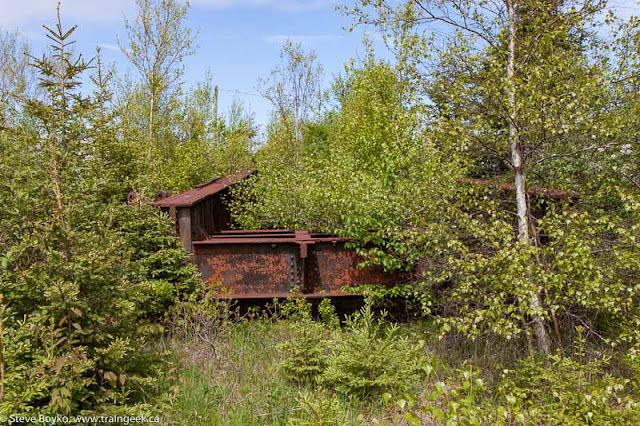 The provincial Department of Natural Resources acquired the station and property from CN. 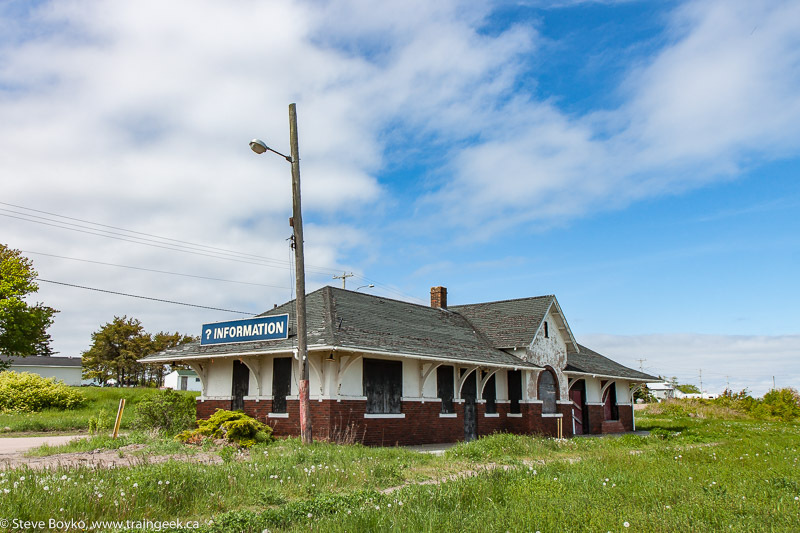 The station was leased by the local Cape Tormentine Community Development Corporation until 2005 and used as a tourist information centre. 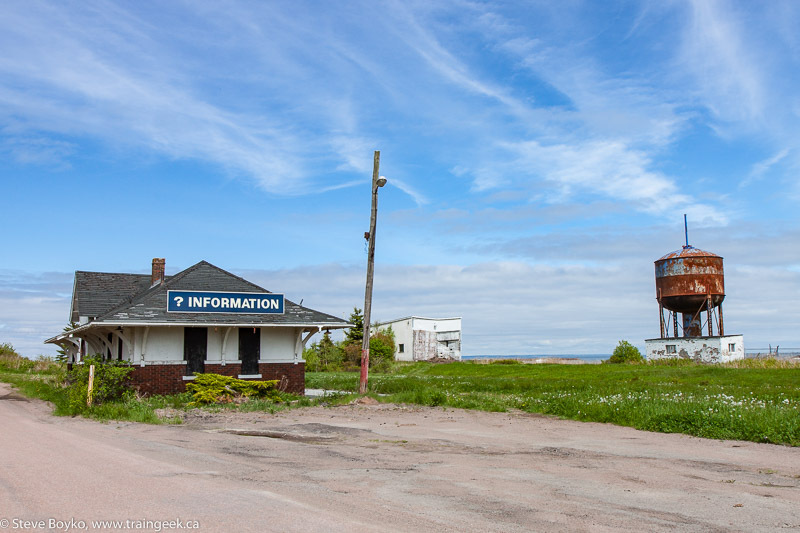 The tourist information function is now performed by the new buildings at Cape Jourimain where the mainland end of the Confederation Bridge touches the land. The station's roof is definitely deteriorating, and I understand the floor has at least partially collapsed inside. The roundhouse is a two stall roundhouse, clearly in some disrepair. I did not go in any of the buildings so I do not know what it is like inside, but I can't imagine it is in good shape. The turntable pit is filled in but the walls of the pit are still evident in places. You can see a portion of the wall in the foreground of the photo above. 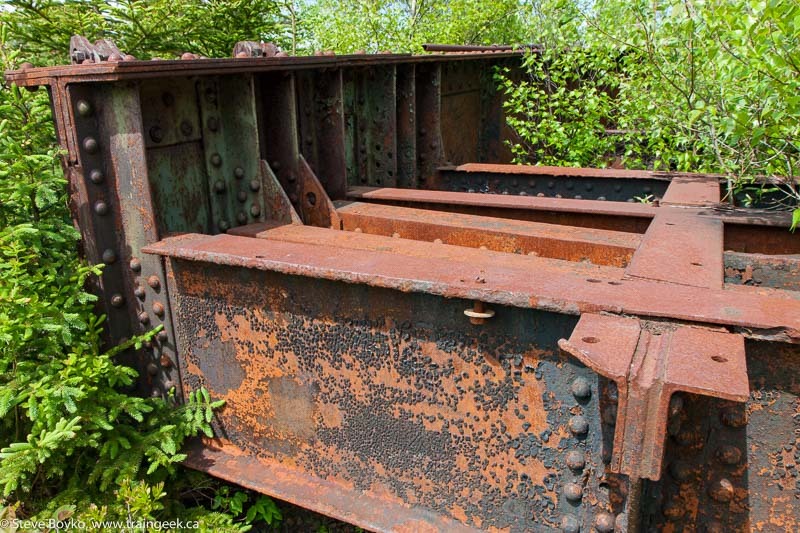 Speaking of the turntable, that is nearby, very overgrown and rusted by this time. I'm told the turntable was air-powered and it was connected to the locomotive on the turntable to provide the compressed air to move the turntable. The railway water tower also stands. I don't know the function of this other building but I have to assume that it was related to the railway. There is no trace of the railway between the station and the wharf as far as I could see. You can drive out to the pier but you can't drive very far along it as most is now fenced off. There is a great view of the Confederation Bridge from here, though! That was my visit to Cape Tormentine. 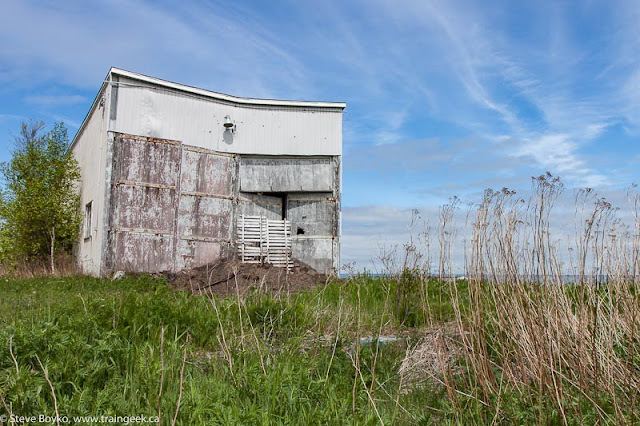 If you are driving to Prince Edward Island, I encourage you to drop by and have a look at these relics of the ferry operation while they are still there. There have been calls to have them demolished. I reached out to the provincial government and Jean-François Pelletier from the Communications Department responded very quickly to provide some background on who owns the station and area. It is owned by the provincial Energy and Resource Development (ERD) department, formerly the Department of Natural Resources. He provided some details on its recent history, included above, and said that in 2015 an engineering firm "was retained to assess the condition of the buildings". The firm recommended that the buildings should be removed. This month, an engineering firm was engaged to survey the site for hazardous materials. Railway sites are often contaminated with various substances, such as spilled coal and diesel fuel and various lubricating oils. 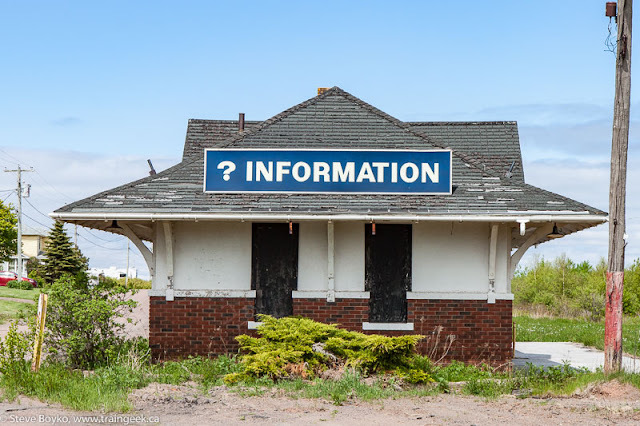 In his email, Mr. Pelletier concluded, "Once the results of the Hazardous Material Survey are received, ERD will be in a position to make recommendations regarding the future of the site." 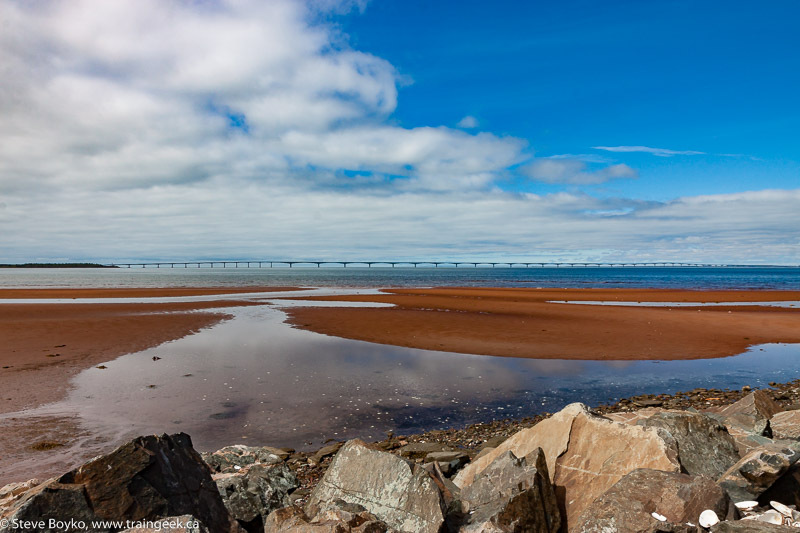 There were four ferries operating on the Cape Tormentine-Borden route when the Confederation Bridge was being completed: MV John Hamilton Gray, MV Abegweit, MV Holiday Island and MV Vacationland. The first MV Abegweit is in Chicago and the second MV Abegweit has been scrapped. MV John Hamilton Gray was sold and eventually scrapped. 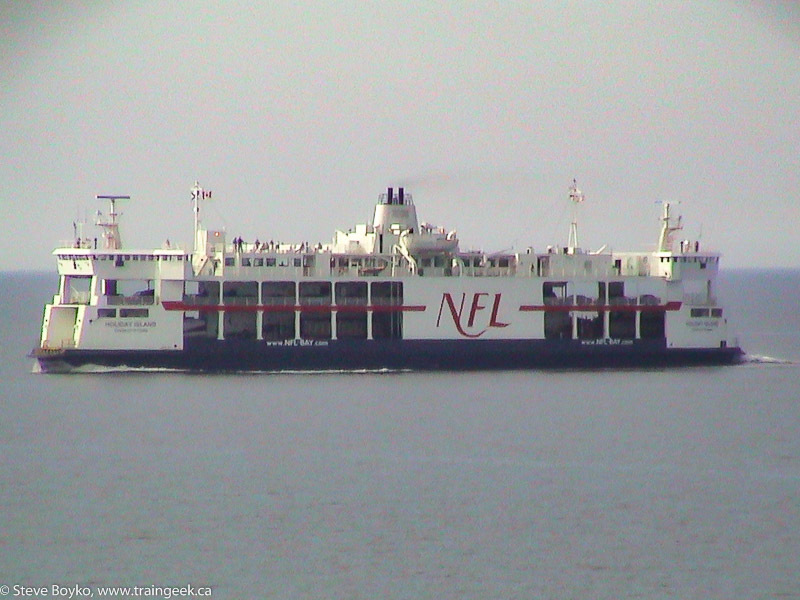 MV Holiday Island continues to serve PEI on the Wood Islands - Caribou route between PEI and Nova Scotia, working that route with MV Confederation. The accompanying photograph was taken from on board Confederation, en route to PEI. MV Vacationland was acquired by the province of New Brunswick for Grand Manan service but never put into use. At last report she was in Quebec for refit for freight service. The wharf itself is privately owned. The lighthouse at the end is owned by the Canadian Coast Guard and is off limits. The rear lighthouse, pictured above, is deteriorating. 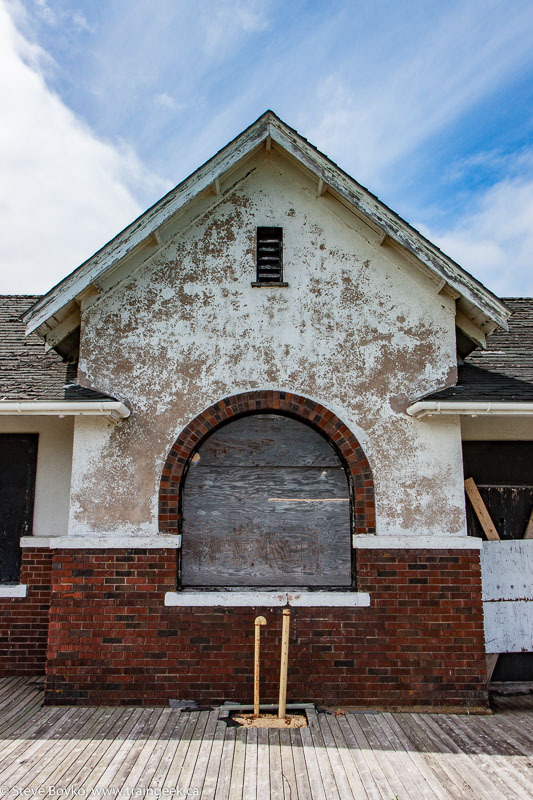 The Cape Tormentine railway station was demolished in early November 2016, after a provincial government tender was issued for its removal at the end of August. The status of the roundhouse, turntable and water tower is unknown at this time. Great site! I just discovered you and I am looking forward to go through your post. We seem to have some mutual interests. Thanks for all the info about Cape Tormentine. My wife and I were in the east just a few weeks ago and went over the new bridge. About 40 years ago we took the ferry from there over to PEI. I remember all the old wood reefers on the PEI side, waiting for the potato harvest I suppose. I wasn't all that keen on rail at that time - mores the pity. It would have been an opportunity to get a lot of photos. I would like to have seen the station area ever today - and thanks to your great photos I can do that. Great stuff! (sat least we travelled by train - from Toronto to Halifax and return). Too bad Railway Station can't be saved. I believe the Ferry Terminal at the Cape was torn down a few years ago, but the one in Border is still standing, I believe the Confederation Bridge Administration uses the Borden Terminal as offices and a maintenance depot. Hi Jim, thanks for your comments. I am sure I went through Cape Tormentine once or twice when I was a child, but I wasn't keen on rail at the time either and took no real notice of it. Hi SHNorth123, there are a few buildings still standing on the Borden side. They have a (replica) train station there with a caboose, too. Everything train related was demolished in the fall of 2016. You wouldn't even know a train went down here now. Thanks, Jamie, I had heard that. It's sad that nothing was kept.